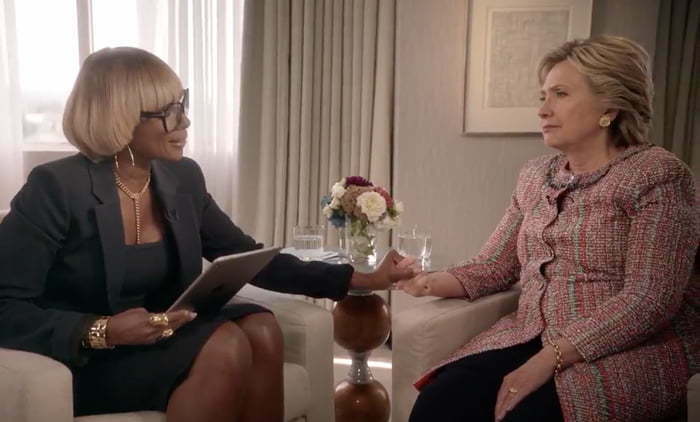 Mary J. Blige used her awesome voice to sing about police brutality in her new interview with Hillary Clinton on her show “The 411″ on Beats 1 radio on Apple Music. In a clip from the interview posted on Apple Music Twitter page, Mary J song a cover of Bruce Springsteen’s “American Skin (41 Shots).” “If an officer stops you, always be polite / And never, ever run away / Promise mama you’ll keep your hands in sight / Is it a gun, is it a knife, is it a wallet, is this your life / It ain’t no secret,” she hip hop soul icon sings. Mary J. Blige also asked Hillary Clinton about Congress treatment of President Obama over the course of his 8-year presidency from doing many of the things that he wanted to do. The full interview will be aired on Friday. Watch snippet from the interview below.